The instruction design, synchronous and asynchronous communication tools, the students' learning interactions with concept mapping, my interactions with the lecturer, and the lecturer’s interactions with his students, and the evaluation process of the lecturer were all evaluated to answer the research question an supported with the outcomes of the literature review. Gomez, G. (2008). 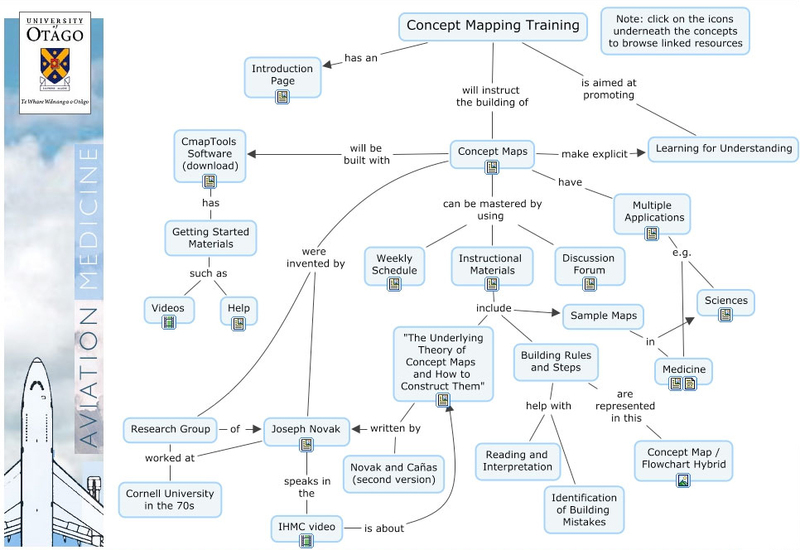 Use of concept maps for student assessment in an aviation medicine graduate programme (Final report for Dr Rob Griffiths and for the CALT Grant Committee). 136 p. New Zealand: University of Otago. Gomez, G. and Griffiths, R. (2008) Automated Assessment of Concept Maps representing Conceptual Understanding, Spotlight on Tertiary Teaching and Learning Conference, November 19 - 20, University of Otago Dunedin, New Zealand.